Fertilization When you fertilize your lawn properly, you will have a healthy, dense turf that maintains a deep green color and chokes out weeds. Nitrogen is every lawn’s most important ingredient. How often can I fertilize my lawn? Fertilizer affects not only lawn appearance, but also maintenance level. 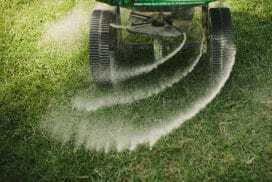 The more you fertilize, the more you’ll … Continue reading How Often Can I Fertilize My Lawn?